Last week I confessed that I was “torn” between two competing world views: the world is in a mess so the market will continue to go down, or we are at the bottom of the mess, and the market will go up in 2009. I gave you my thoughts last week (I’m a pessimist); now it’s your turn to predict the future. I have posted a blank predictions document; save it on your computer, edit it, and then e-mail it back to me at the Buy High Sell Higher 2009 Predictions Mailbox. This e-mail address will remain active until December 31, then I’ll delete it. On January 3 I will post your predictions on the Buy High Sell Higher 2009 Predictions page. (Go to the Buy High Sell Higher 2009 Predictions page to download your copy in either Word or html format). Everyone who submits a coherent prediction gets their own page in the Predictions section. The predictions will remain there forever (or until I take them down). I think it will be instructive to look back over time and see how accurate we are. Depending on how many of you respond, I may try to summarize the results to determine the consensus of the group. I am of the view that none of us has even the faintest clue what’s going to happen in 2009, since none of us had the faintest clue a year ago when asked what 2008 would be like. I don’t recall anyone predicting a massive market crash, and the failure of the entire U.S. investment banking industry, and the almost failure of the North American automotive industry, but that’s what happened. I therefore don’t believe that anything particularly useful will be served by all of us predicting the future, just as nothing much was accomplished by all of my predictions since starting this blog at the end of 2006. However, it appears that my corner of southern Ontario will be snowed in from now until after Christmas, and many parts of North America are also experiencing lousy weather, so typing up some predictions will give us all something to do. I’ll be asking for your predictions on the market, but feel free to predict anything else at all, just for fun. (Here’s a good one: I predict the phrase “global warming” will gradually disappear in 2009, since it seems to be getting colder where I live). One of the areas for prediction will be the price of gold in 2009 (I’ll ask you to predict the quarterly closing prices). I am on record as believing that gold will rise in 2009, probably by a significant amount. However, it will not increase in a straight line. 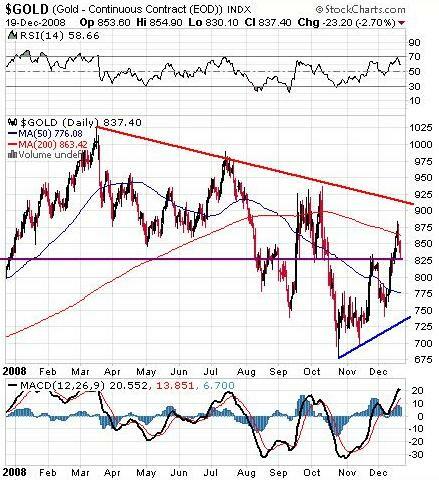 As this three year gold chart shows, it can be argued that the major uptrend started in the summer of 2006, and continued even through the declines of the summer of 2008. It also appears obvious that gold has been in a downtrend (see the red line) since the peak in March 2008. 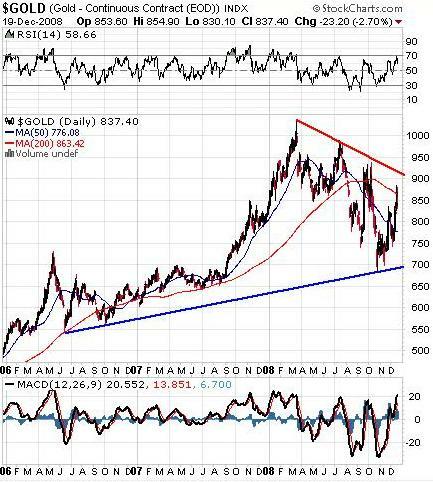 Until gold breaks decisively above $900 (say to $950), or below the base at $700, the ultimate trend will not be known. My current game plan is to assume that gold will fluctuate in the current range of $750 to $900 for a while longer. Looking at a one year gold chart, a more narrow trading range may be between the 50 day and 200 day moving average, or somewhere between $776 and $863. An obvious buy sign will arrive when the 50 day moving average crosses over the 200 day moving average and trades higher (ie. the 50 day moving average higher than the 200 day moving average), which hasn’t happened since the start of this run at the end of 2006 (see first chart). Even more interesting about this chart is the purple horizontal line I drew from the current price to the price one year ago. We closed on Friday at $830; a year ago gold was around $800, so despite the market turbulence, gold is actually trading higher today than it was a year ago. For comparative purposes, the DOW is down 35% in the last twelve months, the S&P 500 is down 39.5%, and the Nasdaq is down 40.65%. Those stats prove that gold has in fact been a good store of value over the last year, and I believe it will continue to be in 2009. Practically, I will continue my practice of doing out of the money covered writes on my core gold holdings after an upswing, and then closing them out on down days. This strategy didn’t work well during the big upswing in December (I covered too soon), but as we are probably nearing a short term peak, I suspect it will work well over the next week or three. I will provide more detailed thoughts in two weeks when I post my predictions for 2009 (so you will all know to do the opposite of whatever I suggest). For know, there are foot high snow drifts on my driveway (and that’s after my good wife spent 90 minutes freezing to death on the tractor yesterday so I could get my car in the driveway when I returned home from work) so duty calls. I suspect the activity on the Forum will be slow this week as we all take a well deserved break for the holidays; let’s recharge our batteries and get ready for next year. And don’t forget to go to the Buy High Sell Higher 2009 Predictions page to submit your predictions for 2009.